Congratulations Islanders - since 2015 over 65,000 pounds of food scraps have been collected each Saturday and transformed into compost. The Roosevelt Island Garden Club, iDig2Learn, and Island Girl Scouts are thrilled to announce that our food scrap partner Big Reuse will host a compost giveaway on Saturday, April 14th, 2018. Stop by the food scrap drop next to the Farmers Market this Saturday from 9:30 am until 2 pm and take home some compost for your houseplants, windowsill herbs, tree pits or garden projects. Bring your own container. This RIOC approved partnership helped Islanders divert 32 tons of waste from landfill and is growing each Saturday as islanders add their food scraps. Composting also means fewer trips to the garbage chute because separating wet organics out keeps your trash dry longer. Fill a Tupperware with weekly coffee grinds, pasta, bread, egg shells, vegetable and fruit scraps in the refrigerator or freezer and drop each Saturday. Even avocado and mango pits are okay to drop! 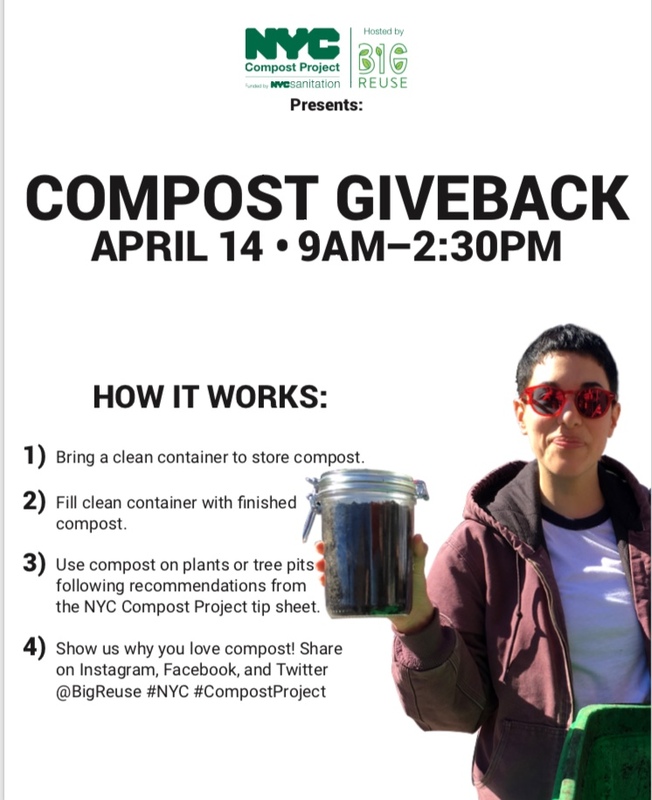 Big Reuse will host the Roosevelt Island Compost give away on Saturday, April 14, at the Roosevelt Island Food Scrap Drop Off location in Good Shepherd Plaza. We compost food scraps locally at our processing site under the Queensboro Bridge in LIC. In 2016, we diverted over 1 million pounds of organic waste from landfills! Watch this November 2017 Facebook Live video for more info on the Big Reuse food scrap compost processing under Queensboro Bridge in Long Island City. 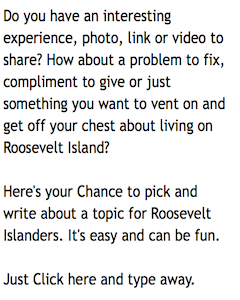 More on Roosevelt Island food scrap composting at this previous post.